We offer the following payment methods for your doll. Place your order and let it be pending, then contact sales@yourdoll.com for our bank information. You may use the balance in your account to pay for your order. You can pay with Credit Card directly. Also, you can pay with credit options of PayPal, Visa, MasterCard, American Express, JCB, Discover. 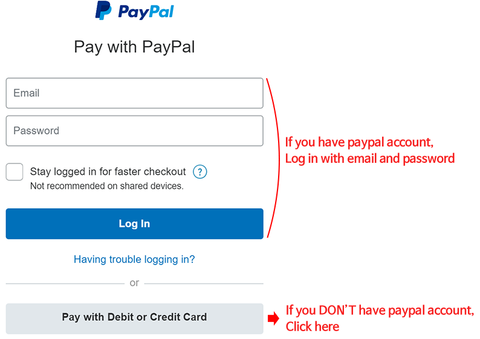 No Paypal Account is Required when you pay through PayPal. When viewing your credit card banking statement, ‘your toys* YD’ is the business name – this is for discretion. If you prefer this method, please call us at (+1) 626-407-2870 (M – F, 9AM – 5PM PST) and make payment. We can split the total amount into different payments to make it easier for you. Just send us an email and let us know which doll you want and we will prepare an invoice for you allowing flexible payments so you can start paying for your doll now. We will set a minimum payment as a deposit ($200) and you can pay the rest of the balance at your earliest convenience or whenever you want. It’s non-refundable. Once you complete the order balance, we will send you a confirmation email and we’ll start working on your doll. No interest and you can pay whenever you want: daily, monthly, weekly, or to pay in full. You’ll be able to pay your balance over time, whenever you want. If you have any further question, please feel free to contact sales@yourdoll.com or call us at (+1) 626-407-2870 (M – F, 9AM – 5PM PST). Please note that our system currently does not work well with an In Internet Explorer browser. If you’re using IE, then the Firefox and Google Chrome will be the best choice. If the same issue happens, kindly refer to the following details. PayPal is blocking the purchase. If you are receiving a receipt error for a PayPal order then likely there is an issue with your PayPal funding source. Please contact PayPal.com support for more information. Credit/debit cards or billing address info. does not match that on file with the bank. The credit card issuer may decline a charge if your provided billing address which is different from their information on file, such as incorrect account/billing details(card number, expiration date, billing zip code, CVV/CVC), purchase not authorized by the card owner, the cardholder’s spending habits, or expired credit card. The payment processor rejected the payment due to the anti-fraud billing address or card verification checks. In these cases, the payments are just in a pending state and have not been received by YOURDOLL. Since the processor has not completed the transaction the funds will be rejected or will be automatically returned to your account within a few days. Depending on the country in which you are located you might have to call your bank to check the limitations of your credit card account to authorize your credit card for online, cross-border or overseas transactions. Please double check the credit card information you have entered and make sure your billing address matches this information exactly. If this is the case, you should contact your bank for additional assistance. Your card is not supported. Depending on the country in which you are located you might have to call your bank to authorize your credit card for online, cross-border or overseas transactions. If none of these issues apply, please contact us with your order number(if there is), name and email address, error notification and the screenshot of the error, we will check the details and assist you in continuing the order. Last but not least, note that you should be able to receive detailed information for any failed or successful transaction from your bank. If a payment fails, do not hesitate to contact your bank and request this information.